Why did we choose the Montessori Method? Bright Child Learning Center is a Montessori Preschool in Madison, WI that provides every child with care, an environment, and a curriculum that stimulates their creativity and natural desire to learn. We are dedicated to helping children develop and demonstrate a love of learning through the cultivation of a culture of respect: respect for themselves, their environment, and the entire world community of which they are members. To prepare our youth both educationally and emotionally to become positive, productive and successful members of our community. Our curriculum is based on the Montessori philosophy to encourage independence, respect, and self-reliance. We are a member of the American Montessori Society (AMS) and are also designing our program to exceed state licensing requirements, the Wisconsin Model Early Learning Standards (WMELS), and the National Association for the Education of Young Children (NAEYC) accreditation requirements – which only 8% of all childcare centers have accomplished. for more information, visit the AMS Website. 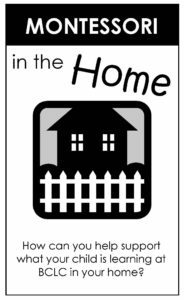 Download "Montessori in the Home"